1Universidad de San Martín de Porres. Facultad de Medicina Humana. Instituto de Investigación, Centro de Investigación de Medicina Tradicional y Farmacología. Lima, PERÚ. 2Sociedad Científica de Estudiantes de Medicina de la Universidad de San Martin de Porres. Lima, PERÚ. Context: Maytenus macrocarpa (Chuchuhuasi) has long been employed in Peru as a traditional alternative therapy for several diseases, including cancer, arthritis and diarrhea. Recent studies show that several species of Maytenus have effects on nociceptive and inflammatory signaling, as well as toxic effects on behavioral neuronal pathways. 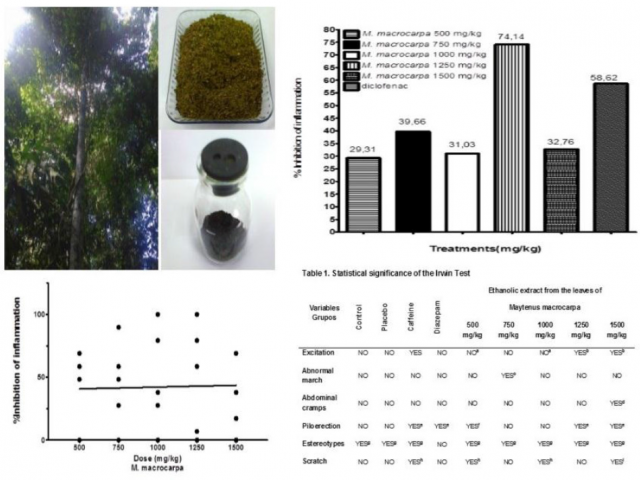 Aims: The aim of this study is to evaluate the anti-inflammatory effects and neurobehavioral side manifestations of the leaf of Maytenus macrocarpa (Ruiz and Pavón) Briquet. Methods and Materials: Experimental study, double blind. 60 male albino mice strain Balb/c were divided in ten groups and each group, was orally feed with different doses of ethanolic extracts of Maytenus macrocarpa (500, 750, 1000, 1250 and 1500 mg/kg), others group received distilled water, caffeine 32 mg/kg, diazepam 32 mg/kg, diclofenac 15 mg/kg and the last group without substance. Neurobehavioral effects were assessed by the Irwin test. The anti-inflammatory activity was measured by the Carrageenan paw oedema test. Statistical analysis was performed with ANOVA test and Fisher exact test. Results: Anti-inflammatory effects of M. macrocarpa were observed in a non-significant trend of dose dependent form. M. macrocarpa displayed an anti-inflammatory effect at 1250 mg/kg and these effects were higher in comparison with diclofenac (74.14% vs 58.62%, one way ANOVA, p<0.05). Neurobehavioral side effects secondary to M. macrocarpa therapy were also identified, these included excitation, abnormal gait, abdominal cramps, piloerection, stereotypes and scratching (Fisher exact, p<0.05, CI 95%). Conclusion: M. macrocarpa leaves presented anti-inflammatory activity and concomitants neurobehavioral side effects. Elmer L-, Henry M-, Alexander M-, Karola M-, María M-, Zaida L-, et al. Anti-Inflammatory and Neurobehavioral Effects of the Leaves from Maytenus macrocarpa (Ruiz and Pavon) Briquet in Mice. Pharmacognosy Journal. 2019;11(1):75-80.